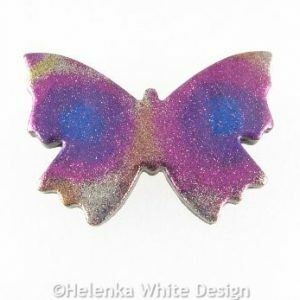 Here you can find polymer clay jewellery designs made with very fine glitter. Lying cat pendant in pink – handcrafted with polymer clay, ultrafine glitter in pink, blue, green and purple, and varnish. The pendant hangs on a gold bronze chain, which closes with a gold bronze lobster clasp. Lying cat pendant in blue – handcrafted with polymer clay, ultrafine glitter in blue, pink, green and purple, and varnish. The pendant hangs on a silver plated chain, which closes with a silver plated lobster clasp. Lying cat pendant in green – handcrafted with polymer clay, ultrafine glitter in green, blue, pink and purple, and varnish. The pendant hangs on a silver plated chain, which closes with a silver plated lobster clasp. Cat pendant in blue and green – handcrafted with polymer clay, ultrafine glitter in blue, pink and purple, and varnish. The pendant hangs on a silver plated chain, which closes with a silver plated lobster clasp. Colourful sitting cat pendant – handcrafted with polymer clay, ultrafine glitter in blue, pink and purple, and varnish. The pendant hangs on a silver plated chain, which closes with a silver plated lobster clasp. 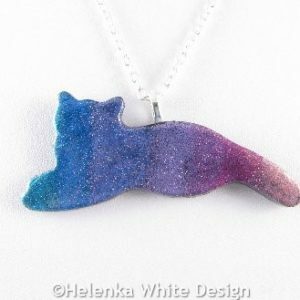 Large sparkly cat pendant – handcrafted with polymer clay, ultrafine glitter in blue, pink and purple, and varnish.The pendant hangs on a silver plated chain, which closes with a silver plated lobster clasp. Sitting cat pendant in blue – handcrafted with polymer clay, ultrafine glitter in blue, pink and purple, and varnish.The pendant hangs on a silver plated chain, which closes with a silver plated lobster clasp. Sitting cat pendant in purple – handcrafted with polymer clay, ultrafine glitter in purple, gold, pink and blue, and varnish.The pendant hangs on a silver plated chain, which closes with a silver plated lobster clasp. Cat pendant in gold and purple – handcrafted with polymer clay, ultrafine glitter in gold, purple, pink and blue, and varnish.The pendant hangs on a silver plated chain, which closes with a silver plated lobster clasp. Gold and purple glitter angel wing pendant – handcrafted with polymer clay, glitter in gold, purple and pink and varnish.The pendant hangs on a silver plated chain, which closes with a silver plated lobster clasp. 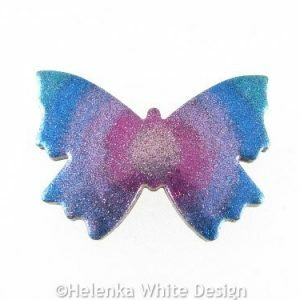 Glitter heart pendant – handcrafted with black polymer clay and ultrafine glitter in purple, gold, blue and pink. It hangs on a silver plated chain. The chain closes with a silver plated lobster clasp. Glitter heart pendant – handcrafted with black polymer clay and ultrafine glitter in gold, blue, purple and pink. It hangs on a silver plated chain. The chain closes with a silver plated lobster clasp. Round polymer clay glitter pendant. Handcrafted with black polymer clay and ultra fine glitter in purple, pink, blue. It hangs on a black buna cord and closes with a silver plates lobster clasp. Square polymer clay glitter pendant. Handcrafted with black polymer clay and ultra fine glitter in gold, pink and purple. It hangs on a black buna cord and closes with a silver plated lobster clasp. Colourful dog pendant handcrafted with black polymer clay and ultrafine glitter in various colours. The pendant hangs on a silver plated chain. 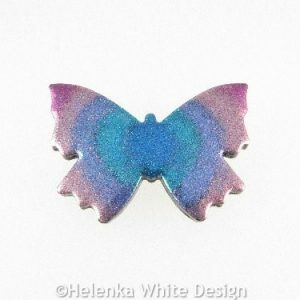 Polymer clay butterfly brooch handcrafted with polymer clay, ultrafine glitter in green, blue, purple and pink and varnish. 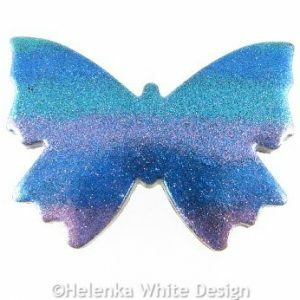 Handcrafted polymer clay butterfly brooch made with polymer clay, ultrafine glitter in blue, purple and green and varnish.